Melt the spread in a wok or large frying pan, add the garlic and cook, stirring, until soft. Add the pork and stir fry over a moderately high heat until no longer pink. Add the vegetables and stir fry for about 5 minutes until just cooked. 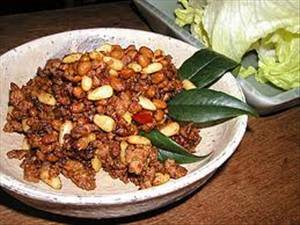 There are 349 calories in 1 serving of Chili Pork and Cashews. Calorie break-down: 39% fat, 34% carbs, 27% protein.